As an artist based in Tasmania, what motivated you to enter the Blacktown City Art Prize? There were two reasons for my entry. The first was simply to enter competitions around Australia because it helps one’s CV and helps exhibit one’s work where it might normally never be seen. It feels good to have new audiences. My work is not attractive, aesthetically appealing and it sells poorly. Approval by distant audiences can be uplifting. No matter how many times one tells oneself to follow one’s heart, approval still feels rather nice, deep down. Secondly, Blacktown is a peripheral place – a place where community is vital and cross-cultural awareness and activities are strong and enrich the community. I have succeeded in the Cossack Award in Karratha, Western Australia and the Outback Award in Broken Hill too. My work is in their collections. Imagine that! I love that feeling! My work deals with the core of the animal nature in us all, which is often concealed and avoided. I find these truths are often, interestingly, more acceptable beyond the central city zone. Life and death are much more visible beyond the suburbs. As an artist working far from Blacktown, how did you find the logistics of applying for the Prize, and then transporting the work to Blacktown after being announced as a finalist? This was not so hard, actually. I used a local delivery firm, with local staff who usually care for my work. In addition, the staff [at Blacktown Arts] are cheerful and really helpful with all of the logistical arrangements as required. After winning the 2016 Blacktown City Art Prize, how did the recognition and funds assist with your professional development as an artist? Oh gosh… it paid for an outstanding framing bill and outstanding materials bill. It also provided funds for my next big load of paper and pigment! Being professional about archival materials and my artwork does cost a substantial amount. I also felt some degree of impetus to apply, successfully, for Regional Arts and Arts Tasmanian funding for my current 3-year project about Flinders Island titled I Shed My Skin, A Furneaux Islands Story. It also provided cause for publicity and celebration across social media platforms. My little name has started to scratch across our Bass Strait. Do you have any advice for artists who are thinking of entering the 2018 Blacktown City Art Prize? Entering prizes around Australia helps to strengthen resilience as an artist. Rejection, the most common response, is well worth it for the few acceptances and occasional awards. I was rejected for many years, and sometimes, when one’s hopes are high, it can really hurt! I have had to just sigh a little, laugh it off, and move on! It is not really personal. I know I must build better works, build my skills, strengthen my concepts and just keep working. My best work is always ahead of me. I have raised two children alone, have been teaching in a state school full time for three decades, and have never stopped working at my practice. It is life. Receiving the Blacktown City Art Prize, by a community and judges who knew nothing about me at all was a reward and a deep honour. Naomi Grant is a Perth-based artist with connections to Blacktown. In 2017, her artwork Dad’s Country was awarded the Aboriginal Artist Prize. The artwork was also acquired into the Blacktown City Art Collection. The judges commended the artist’s contemporary style of blending Indigenous painting techniques with Western agricultural landscape depictions to create a fresh take on abstract painting. Why did you enter the 2017 Blacktown City Art Prize? I enter a lot of competitions that are consistently promoting high quality art. I have entered the Blacktown City Art Prize 3 times now – substantial prize money is a big draw. Can you explain your “contemporary style” and how you negotiate different painting techniques and landscape depictions in your works like Dad’s Country? Over the years I have explored many styles and techniques in painting. In the last 18 years, I have been working with collage techniques of layering tissue paper over and under the painted surface. Most of the papers are transparent and I began to build up a pattern of colours and designs that are transparent through the layers. This gives the work lots of depth. In Dad’s Country I poured the background paint – a technique of laying the canvas flat and pouring paints directly onto the canvas. After that dried I layered areas with tissue paper to build texture and depth and greater layers of design. This piece is also an aerial perspective, which lends its self to being abstract in nature. It is the general layout of the town of Cowra, the birthplace of my father. What is your connection to Blacktown? I actually grew up in Blacktown from the ages of 1 to 10. I went to Blacktown South Primary School. I have many memories of my early life here in Blacktown. I actually had my first art lesson at the Civic Centre in Blacktown, right next door to The Leo Kelly Blacktown Arts Centre. My art teacher was a lovely man called Mr Kenny. My father is Wiradjuri, the largest Indigenous tribe in NSW. So my early years were spent in Sydney and NSW country regions. I was exceptionally thrilled to win the Aboriginal Artist Prize with such strong connections to these regions. 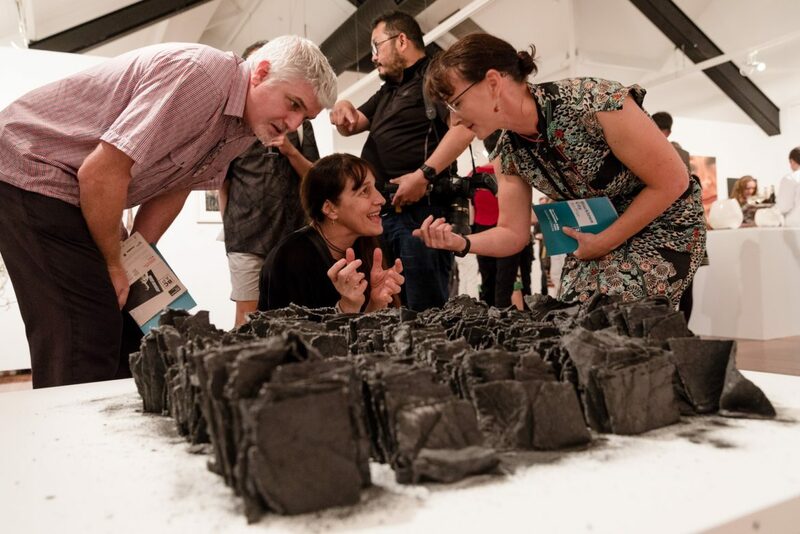 Do you have any advice for artists who are thinking of entering the 2018 Blacktown City Art Prize, especially artists who are based inter-state? Keep pursuing what you love and be true to yourself as an artist. I don’t think there is any magic formula. Every year is different and every competition will have different judges. One time your work will be loved, and the next it will be rejected. This can get very demoralising for artists over time, so you can’t take it too personally. Be organised and keep a spread-sheet of competition dates, deadlines and delivery dates. This is very helpful if you are entering regularly. Write up a good CV, a good description of your work and statement of yourself as an artist that you can regularly use. Take good high-resolution images of your work. Find a good freight company. The best to date I have used are Interparcel.com where you book online yourself and choose the carrier. Don’t leave it till the last minute if you are shipping from interstate as lots of things can go wrong. Enter the 2018 Blacktown City Art Prize! Entries close Tuesday 9 October 2018. Internationally acclaimed, Blacktown-based artist Khadim Ali is exhibiting new work in our current exhibition Daneha. In 2016, Khadim received a residency through our Creative Residency Program. 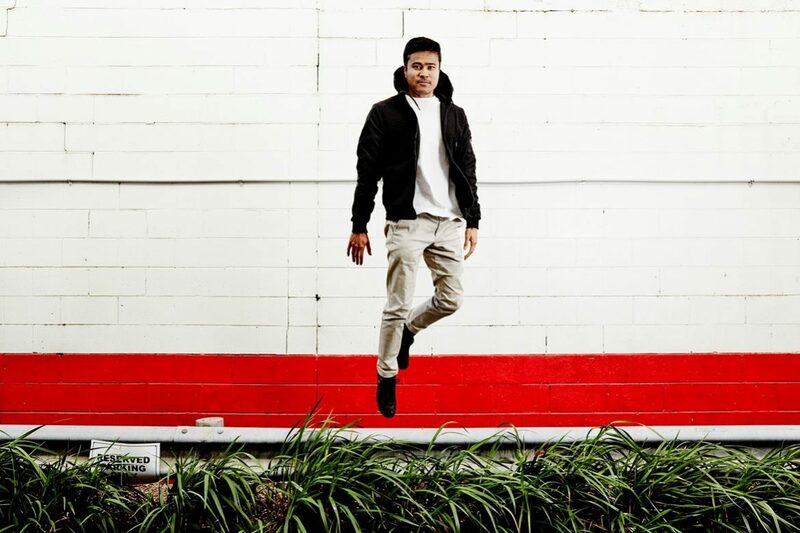 In this interview, he reflects on his journey as a Hazara artist living and working in Blacktown. Tell us about your personal history and artistic journey as a Hazara artist living in Blacktown . My great-grandfather escaped persecution in Afghanistan in the 1890s and moved to India. After the partition of Pakistan and India, they chose to live at the border of Pakistan and Afghanistan in hopes that one day, Afghanistan will have a fair government and would welcome them back to their nation as citizens. This of course, never eventuated. So I am a third generation Hazara of these Hazaras who escaped Afghanistan. I moved to Blacktown in early 2014 and have found it a very friendly and multicultural suburb of Sydney. Blacktown’s cultural diversity brings excitement for its locals who share their traditions and customs with our community. What are the main themes and emotions behind your artistic work and practice? Khadim’s Blacktown Arts Main Street Studio, 2016. Photograph by Emily McTaggart. In the 1970s, the Hazaras in Quetta were granted citizenship by the government of Pakistan. I was born in Quetta as a Pakistani until 2005 when the persecution of Hazaras was at its peak in Pakistan with the presence of the Taliban and Al-Qaeda. Hazara killing was normalised in the city of Quetta. In the last 15 years, more than 2000 Hazaras have been massacred without a single perpetrator being charged by the government of Pakistan. This bred fear – a fear that led me to live in Australia. I am the illustrator of the demonisation of minorities in Pakistan and Afghanistan, and those minorities who are seeking asylum all over the world. In 2016 you were granted a Blacktown Arts Main Street Studio Residency where you developed some major works including a commission for the Museum of Contemporary Art (MCA). Tell us about your time at the studio. 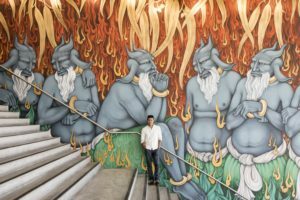 Khadim Ali with his mural ‘The Arrival of Demons’ at the MCA in 2017. My residency at the studios in Blacktown was very productive as the studio was so conveniently close to home. Prior to taking residency in the Blacktown studios, I worked from the Artspace studios in Wooloomooloo. My commute was an hour and 20minutes one way, each day. With the Blacktown studio in such close proximity, I could maximise my time and I produced many works for exhibition while there, including my solo show at Milani Gallery in Brisbane, the refugee show at Casula Powerhouse and of course the MCA foyer wall mural. I developed the early stages of this work from the Blacktown studios through my initial drawings. With the help of Blacktown Arts staff and access to their equipment, as well as the large size of my studio, I was able to prepare for the scale of the MCA mural within my own studio. During your residency with us you received two major awards. Please tell us about these awards. Daneha exhibition installation. Left: Khadim Ali, Golden Country, Steel-cut brass, cotton fabric, 220 x 220 cm. 2018. 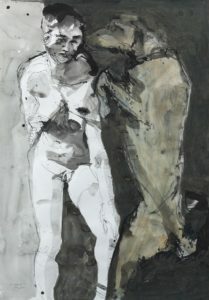 Right: Khadim Ali, with Sher Ali, Untitled 3 from the Transitions/Evacuation series, Watercolour, gouache, ink and gold leaf on wasil paper, 6 parts, 68.5 x 53 cm each, 2014. Photograph by Sharon Hickey. During that time I won the Sidney Myer Creative Fellowship and the Western Sydney Fellowship. The funding from these awards became the lifeline to my work and ideas. The awards have allowed me to travel and research to Afghanistan, Pakistan and South Korea, to also exhibit in the Lyon Biennale, as well as Vienna and Pakistan all within the year. The funding also contributed to my work in Blacktown Arts’ exhibition Daneha. As an international artist based in Blacktown, what would your message be to our local artists, and in particular those from refugee and migrant backgrounds? I think being a practicing artist in Blacktown is much cheaper than living in the centre of Sydney. Living in Blacktown being surrounded by many cultures and traditions is a true asset. It has allowed me to meet so many people from different cultures who share their skills and traditions. Here are a few questions and answers that may help you when considering artworks to enter in the prize. How do I enter the 2018 Blacktown City Art Prize? Entry into Blacktown City Art Prize 2018 is by online application only, at www.blacktownarts.com.au. Entries open on Tuesday 10 July 2018, and close on Tuesday 10 October 2018. To receive notification, sign up to our mailing list. A panel of Judges will select the Finalists from the images submitted with your online entry. The selected Finalists will be notified on Monday 29 October 2018. When I upload an image of my artwork I receive a “500 code” error. What should I do? Ensure that your image file is less than 2MB and no larger than 1500 pixels wide or high. To resize your images, go to www.picresize.com. The entry fee is $26 per artwork. How many artworks can I enter? You can enter 1 or 2 artworks. Each artwork must be registered in a separate entry form. What is the maximum size my work can be? For 2-D artworks the maximum size including frame is 155 cm (height) x 155 cm (width). For 3-D artworks, including sculptures and ceramics, the maximum size is 200 cm (high) x 150 cm (wide) x 150 cm (deep) and must weigh 40 kg or less. Artworks MUST fall within these size and weight restrictions, no exceptions. 1 cm out of this size restriction is not acceptable; 10 grams over the weight restriction is not acceptable. What are D-rings? And do I need them? A D-ring is a small metal ring that is shaped like the letter D. D-rings are attached to frames, one on either side, so the artwork can be hung from these points. You do not need D-rings if your artwork has a synthetic cord on the back. Wire is not acceptable unless it is covered with plastic as it can damage other works. If your artwork is a stretched canvas on a timber frame, it can be hung from the frame. How should I frame my artwork? It is up to you how you would like to frame your artwork. 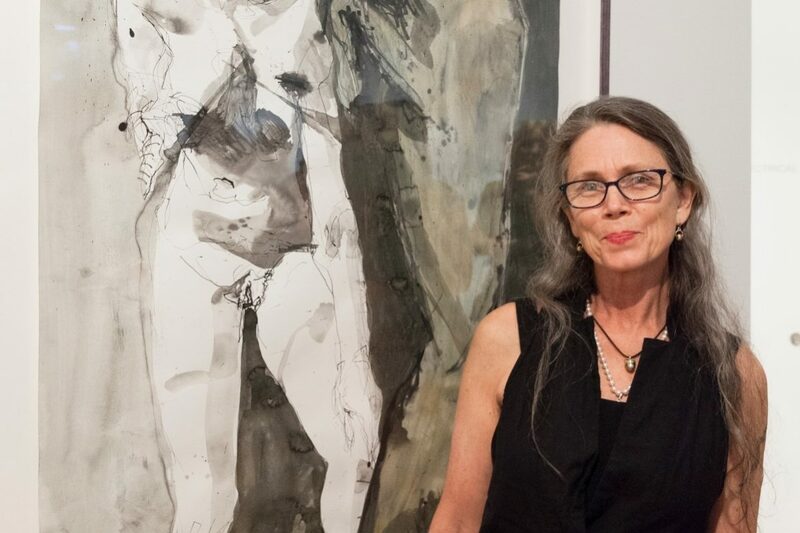 Judges of previous Blacktown City Art Prize exhibitions have commented that simple frames which enhance the qualities of the artwork are better than overly decorative frames. Artworks on stretched canvas do not have to be framed. How will I be notified if my artwork has been selected for the Blacktown City Art Prize? The list of selected Finalists’ artworks will be posted at www.blacktownarts.com.au and on our social media @BlacktownArts. Artworks not included on the list are to be understood as not selected. All entrants will also receive a list of selected artworks via email. If I am selected as a Finalist, when and how do I deliver and collect my artwork? All selected artworks must be delivered and collected from The Leo Kelly Blacktown Arts Centre at 78 Flushcombe Road Blacktown. Enter The Leo Kelly Blacktown Arts Centre car park via Campbell Street, Blacktown. Delivery is on Friday 9 November and Saturday 10 November 2018 (10 am – 5 pm). Collection is on Friday 2 February and Saturday 3 February 2018 (10 am – 5 pm). Will there be someone there to help me unload the artwork from my car? Yes. Just approach Blacktown Arts staff and ask for assistance. Can I assemble my own sculpture? We ask that all 3-D artworks requiring assembly, including sculptures, be accompanied with installation notes. Multi-part artworks may be assembled by artists themselves. However, installation notes with photographs must be provided to Blacktown Arts. Can I install my own artwork? We employ professional art handlers who install all artworks on behalf of the artists. The artists may be asked to assist with the installation of multi-part artworks. Can I get someone to deliver the artwork on my behalf? Yes, however they must have written permission or email to do so, photo ID and details of the artwork being delivered. If I post my artwork will it be posted back to me? Yes. However, all costs, packaging, transport and/or postage arrangements must be made by the artist. Do I need to provide a plinth? No. Blacktown Arts has a collection of plinths that will be used for the exhibition. My artwork needs power, can this be arranged? Yes. However, power points are limited and this will affect where your artwork is installed. My artwork is free-standing but hangs from the ceiling. Is this acceptable? No. Works cannot be suspended or hung from the gallery roof. If it requires suspension it is not deemed to be free-standing. My painting is a stretched canvas. Does it need to be framed? No. However the artwork must be professionally presented and ready to be hung. Can I enter a mixed media artwork? Yes. Both 2-D and 3-D artworks can be mixed media but must adhere to the size and weight restrictions. The artwork details have changed since submitting my entry form. Can I make changes when I deliver the artwork? No. All details must be confirmed when submitting the entry form before the deadline at 5 pm on Tuesday 9 October 2018. Do you need a statement and CV from me? No, however you can choose to submit an artist statement of no more than 50 words with your entry. The statement will only be provided to potential buyers who express interest in buying your work if it is selected for the exhibition. The Judges will not see this statement and it will not be taken into consideration during the judging process. Aboriginal Artist Prize $2,000 plus 3-month artist residency at Blacktown Artists’ Studios in 2019. 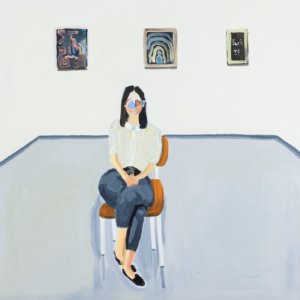 Local Artist Prize $2,000 plus 3-month artist residency at Blacktown Artists’ Studios in 2019. What kind of artworks can I enter? Artworks accepted are 2-D artworks including drawings, prints, paintings, textiles and mixed-media. (Photographs can be included as part of a mixed-media artwork, but singular photography is not acceptable.) And 3-D artworks that include sculpture, ceramics and mixed-media. Artworks not accepted include singular photography, film, video, sound, performance and installation artworks. I live overseas. Can I enter the 2018 Blacktown City Art Prize? No. Entrants must be an Australian resident. Artworks can be made in all shapes and sizes! 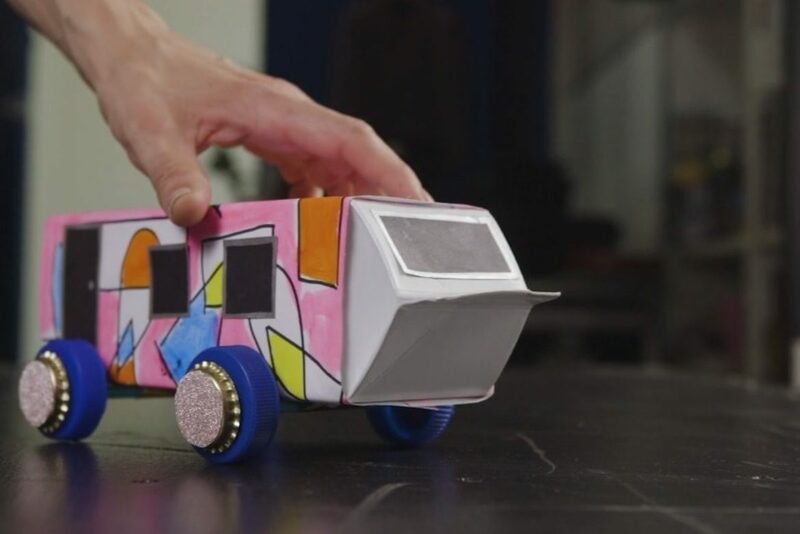 Watch this fun video by Susie from Handy With Scissors and make your own cardboard caravan inspired by Brook Andrew’s artwork Travelling Colony. For his artwork, Brook painted a series of caravans with radial diamond patterns that are important symbols in Wiradjuri culture. 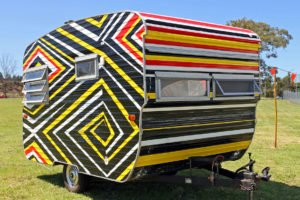 Travelling Colony is a dazzling hand-painted caravan inspired by Brook Andrew’ Wiradjuri heritage, popular culture and the circus. It is a multi-faceted artwork that compels audiences to see issues of race, consumerism and history in different ways. 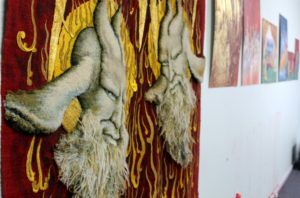 Brook’s artwork is part of the Blacktown City Art Collection, and is on display in the carpark of The Leo Kelly Blacktown Arts Centre, Tuesday – Saturday, 10 am – 5 pm. In what will be the first major artistic engagement with the Afghan and Persian communities of Blacktown, Blacktown Arts presents Daneha, a multi-faceted artistic program made up of a visual arts exhibition, artist talks, musical performances and theatre. Daneha (“Seeds” in English) explores the displacement of the Afghan community across the globe, and the cultivation of roots in foreign, unfamiliar soil. The program will transform The Leo Kelly Blacktown Arts Centre into a multi-functional space for community to engage with contemporary artists, as collaborators, audiences and active participants in reimagining identities. The program launches on Thursday 5 July with a visual arts exhibition featuring new works by Avan Anwar (Melbourne), Elyas Alavi (Adelaide), Zainab Haidariy (Germany), Gerrie Mifsud (Sydney) and internationally acclaimed and Blacktown-based artist Khadim Ali. Khadim is an established artist who was awarded the NSW Government’s 2016 Western Sydney Arts Fellowship worth $50,000 and his work is held in numerous public collections around the world. The arts exhibition will feature works by members of the local group Afghan Women on the Move. “Afghan Women on the Move creates a radically safe platform for women as survivors of war and trauma, to gather and participate in arts and cultural programs, outside of religious and political influences,” said Maryam Zahid, the group’s coordinator. The video work Borderline (2017) by Atefeh Kazemi and Zahra Akhlaqi (Soraya) is also screening as part of this exhibition. 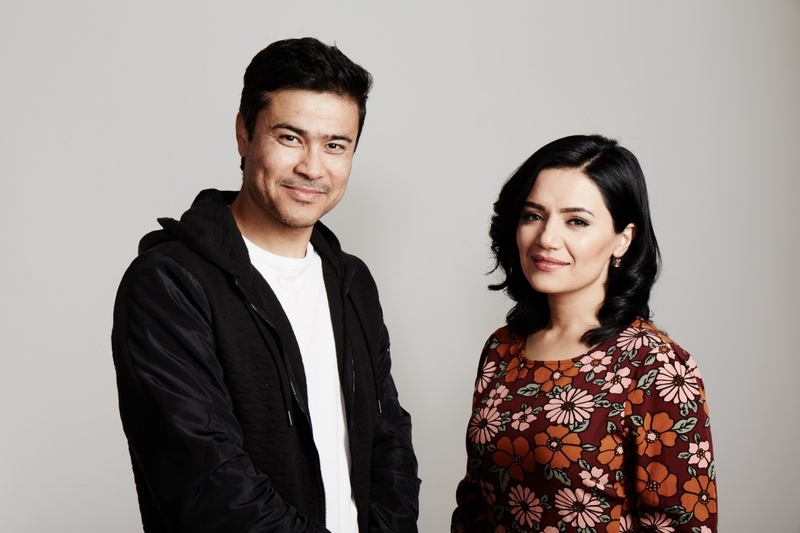 The video is a series of interviews with second and third generation Afghan immigrants who were born in Iran and continue to live in the country. Taking place in June, the women’s artworks will be developed in workshops lead by artist Nazanin Marashian, and will connect identity and culture through the use of personal signs and symbols. The program includes two Artist Talks. The first, on Saturday 18 August, is moderated by Abdul Hekmat and will be an opportunity for audiences to connect with Khadim Ali, Elyas Alavi and Maryam Zahid (Afghan Women on the Move), find out more about their works, life experiences and the program. The second, on Saturday 1 September, is a discussion facilitated by Paula Abood on work creatively with refugee women and will include Maryam Zahid, Monirah Hashemi (international playwright/actor) and international theatre director, Leif Persson, from Teatre Dos. The Daneha program will culminate with the Australian premiere of Sitaraha – The Stars, a moving one woman play which intertwines the stories of three generations of women living in Afghanistan. Navigating war and religious oppression, the women use songs, dance and storytelling to try and keep their stories alive. Taking place from Thursday 6 – Sunday 9 September, Sitaraha features Monirah Hashemi and is based on real conversations and research. Daneha offers a unique opportunity for the people of Blacktown and beyond to come together to reflect on the experiences of migrants and refugees, and join with them in all the challenges and opportunities that present themselves as they regather in new lands. The Leo Kelly Blacktown Arts Centre is open Tuesday to Saturday from 10 am to 5 pm. Admission to the visual arts exhibition is free. Tickets on sale Thursday 5 July 2018. Photograph of Khadim Ali and Maryam Zahid by Joshua Morris. Our current exhibition Recent Acquisitions presents artworks that have been acquired by Blacktown City Council throughout the past 4 years. The exhibition gives our community the opportunity to learn more about the individual artworks and Council’s entire art collection. Like most public art collections, Blacktown City Council’s collection tells the stories of our City through the work of artists, reflecting the concerns and histories of our diverse communities. Western Sydney is home to many public art collections. Does your local Council have an art collection? The Liverpool Art Collection is managed by Casula Powerhouse Arts Centre and Liverpool Regional Museum. The collection was formally established in 1989 with the opening of the Museum. 30 years on, Liverpool’s collection now consists of over 30,000 artworks and heritage objects. Together, these items reflect the rich cultural and historic history of the greater Liverpool region. 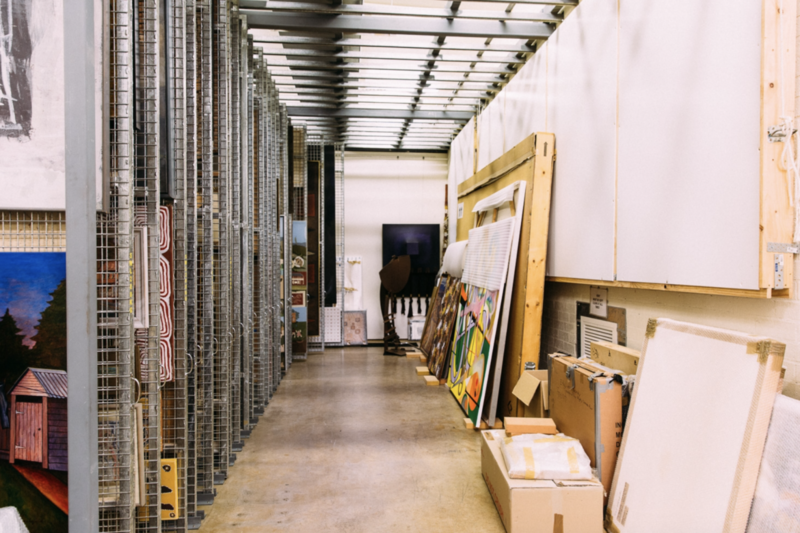 The Campbelltown City Council Collection contains nearly 1,500 artworks that were acquired as early as 1962. 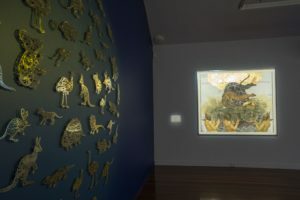 Campbelltown’s collection holds works of national significance by contemporary Australian artists and continues to focus on acquiring art by Aboriginal and Torres Strait Islander artists as well as artists from across the Campbelltown and Macarthur and Western Sydney region. The Penrith Regional Gallery Collection has over 1,600 objects. 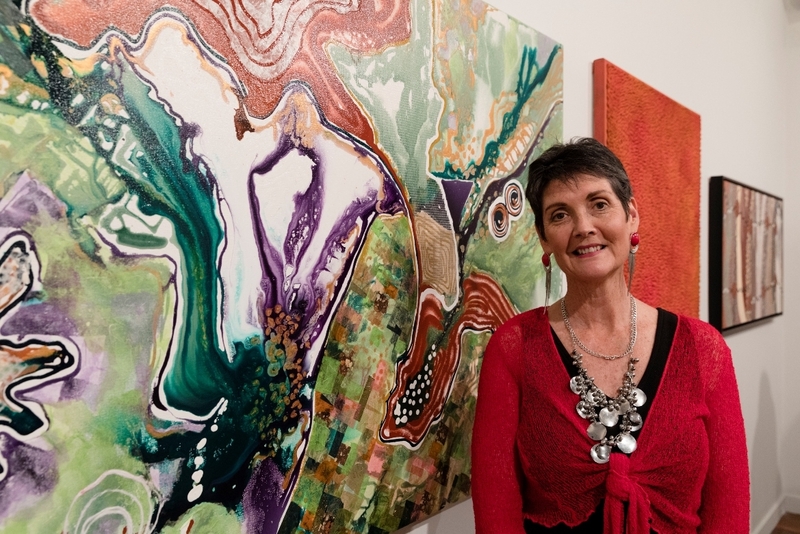 Both the collection and the gallery itself are the result of Margo Lewer’s wish for her home and collection of artworks to be given to the people of Penrith. The collection has grown since the establishment of the gallery and bequest, and now consists of a large range of visual art (painting, drawing, and sculpture), Aboriginal rock engravings, furniture, books, and other printed ephemera. Hawkesbury City Council has a unique and historic collection of 300 artworks, most of which were acquired between 1975 and 1994. In 1999, the people of the Hawkesbury were also gifted with 80 paintings and prints by artists a number of significant Australian artists including Arthur Boyd, Norman Lindsay and Lance Solomon. Visit The Leo Kelly Blacktown Arts Centre to see more artworks from the Blacktown City Art Collection (until 26 May 2018). Campbelltown Arts Centre Permanent Collection. Photograph by Nikki To. Leading Aboriginal and Torres Strait Islander artists Tony Albert, Sharyn Egan and Moogahlin Performing Arts bring fresh ideas and energy to Ngara – Ngurangwa Byallara (Listen, Hear, Think – The Place Speaks). Informed by new community collaborations, their works aim to bring the spirit and culture of the Blacktown Native Institution site to life, and imagine a future for this important landmark. The artworks will be unveiled on the site at Ngara – Ngurangwa Byallara (Listen, Hear, Think – The Place Speaks) on Saturday, 9 June 2018. 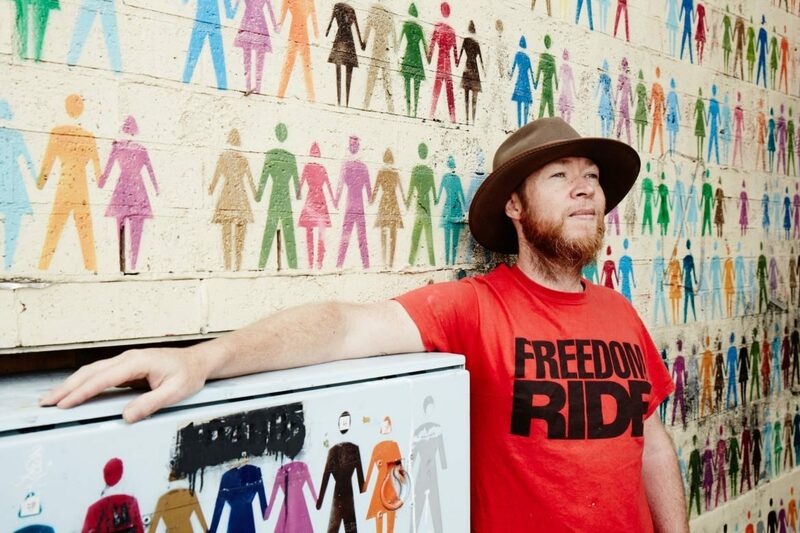 Queensland artist Tony Albert is well known for his innovative approach to collaboration with children and young people. For Ngara – Ngurangwa Byallara (Listen, hear, think – The Place Speaks), he has worked alongside local Darug woman Julie Bukari Webb and 10 local youngsters and their families to create Gubangala Gumadangyiningi (Lets honour his/her spirit), a reimagining and honouring of 10 of the children who originally lived at the Institution. A suite of objects created by Albert and his young collaborators will be utilised in a ceremony to reach across time to heal and share positive memories. Visitors will be encouraged to gift a memory to the reimagined children by describing their gift on paper embedded with vegetation. The paper will be buried onsite and will help to heal the area and build a new and positive future. Perth-based artist Sharyn Egan’s work is informed by her personal experience of loss and displacement as a member of the Stolen Generations, and centres around sharing the medium of weaving with communities during the exchange of stories and experiences. The Blacktown project sees her working with the Baabayn Aboriginal Corporation and local weavers to create a sculptural installation of 7 large-scale flannel flowers made of colourful marine rope. Native to the local area, this delicate flower will be transformed into a monumental memorial to the Institution’s residents, as a semi-permanent installation at the Blacktown Native Institution site. 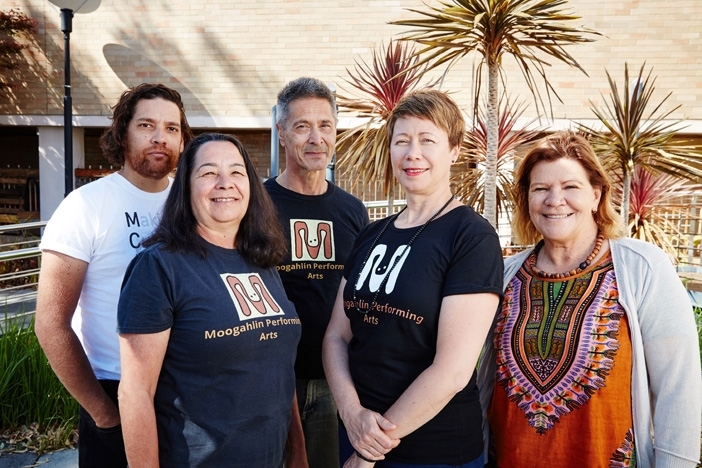 Sydney’s Moogahlin Performing Arts bring their expertise as storytellers and deep knowledge and experience of local community to this event, with manuwi jam ya murong (footprints in the sand). This celebratory work honours local people who have grown up in Blacktown, with the creation of a large scale installation of the Darug totem – the long necked turtle, in collaboration with local community elders, kids and families. On Saturday, June 9 the totem will come to life as the grounds for an evening of dance performance, whilst the installation of traditional gunyas or shelters will allow visitors to experience a moment of private contemplation in this uniquely sacred space. Ngara – Ngurangwa Byallara (Listen, Hear, Think – The Place Speaks) is part of the Blacktown Native Institution Project, a collaboration between Blacktown Arts (an initiative of Blacktown City Council) and the Museum of Contemporary Art Australia (through their C3West Program). The project is supported by Landcom, Gadigal Information Service and Koori Radio. Where: Blacktown Native Institution site, corner Richmond Road and Rooty Hill Road North, Oakhurst. Tony Albert, Lily Shearer, Frederick Copperwaite, Liza-Mare Syron and Sharyn Egan by Joshua Morris. Does a portrait have to look like a person? 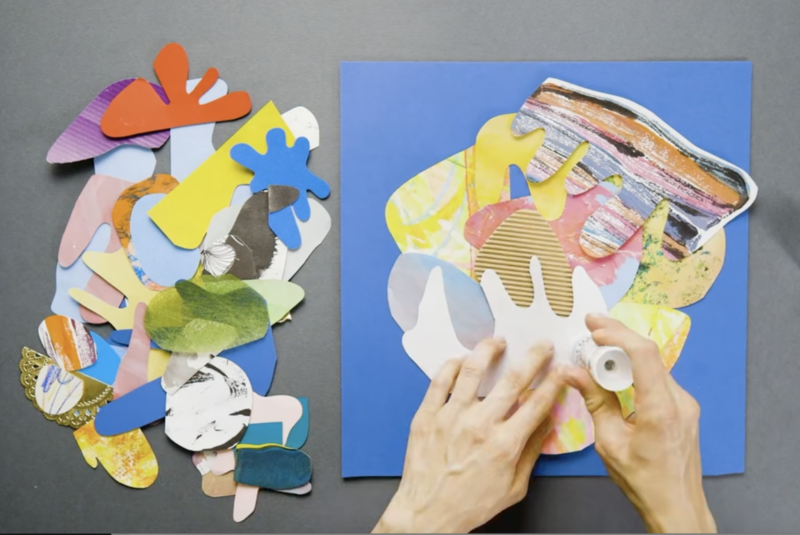 We asked Susie from Handy With Scissors to create a series of fun video activities inspired by the Blacktown City Council art collection. We’ll be releasing one video during each of the 2018 school holidays, so you can make your own art at home! Get started with our autumn video, inspired by Linda Brescia’s portrait of Sophia Kouyoumdjian, Coordinator at Parramatta Artists Studios. Sophia is a portrait based on studio photographs of the subject. The artist arranges paint skins from her palette over facial features and then repaints the composition. The artwork refers to the masks we wear and the personas we assume. Blacktown City Council acquires artworks for its art collection from the annual Blacktown City Art Prize and from projects previously developed by Blacktown Arts. The Collection tells the stories of Blacktown through the work of its artists, reflecting the concerns and histories of its diverse communities. The Collection fosters a sense of civic pride for the people who live, work and play in Blacktown City, development a sense of identity and belonging, and sharing the recent narratives of city life. Recent Acquisitions presents new works acquired by Blacktown City Council between 2015 and 2017. Jason Wing. Photograph by Joshua Morris. Recent Acquisitions features two artworks by Jason Wing, Blacktown Dreaming, 2009, and Know Your Place, 2017.